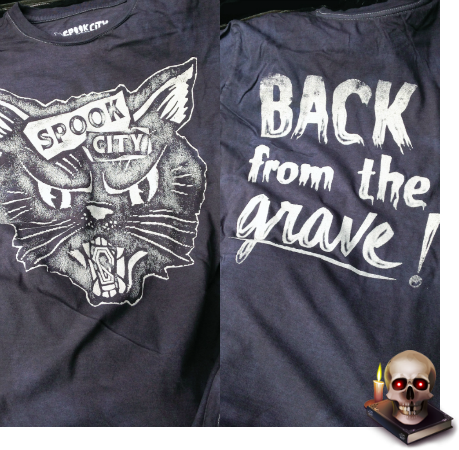 no mas pantalones: SPOOK CITY "BACK FROM THE GRAVE!" SPOOK CITY "BACK FROM THE GRAVE!" Spook City has resurrected their Halloween exclusive from a few years back and given it a few bitchin' upgrades. It now features an additional back print, and this time around is also available in a super limited alternate run of 13 individually customized shirts. The standard "Back From The Grave!" tees are printed on Next Level blank and includes a handwritten size, stamped number, and is packed in a hand stencil box. The "vintage" variants have been hand dyed and soaked in a salt water bath to recreate the lived-in feel of that favorite tee you've worn for years and refuse to part with. If that sounds like your thing, this uniquely crafted shirt will cost you only $1 more than its companion offering. With 31 shirts in total between the two options, these won't be around for long. Purchase one (or both) from the Spook City online shop.